The following books can be used to find out about how works of art were looted, stolen, and dispersed during and after World War II. Click the "Records of Lost Works" tab to find information on specific countries and collections. Akinsha, Konstantin. Beautiful Loot: The Soviet Plunder of Europe's Art Treasures. New York: Random House, 1995. Alford, Kenneth D. Hermann Göring and the Nazi Art Collection: The Looting of Europe's Treasures and their Dispersal after World War II. Jefferson, NC : McFarland & Company, 2012. 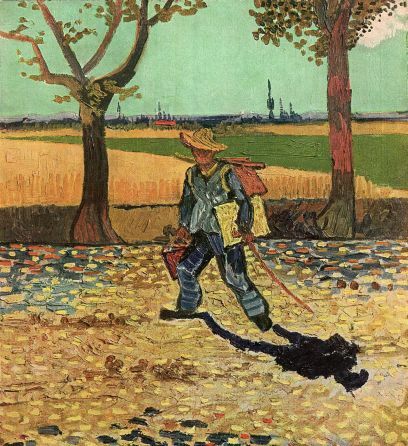 Vincent Van Gogh, Painter on the Road to Tarascon, 1888. Oil on canvas. Seized by the Nazis, this painting is thought to have been destroyed when the Allied forces bombed Magdeburg, setting fire to the Kaiser-Friedrich Museum, which contained stolen art.